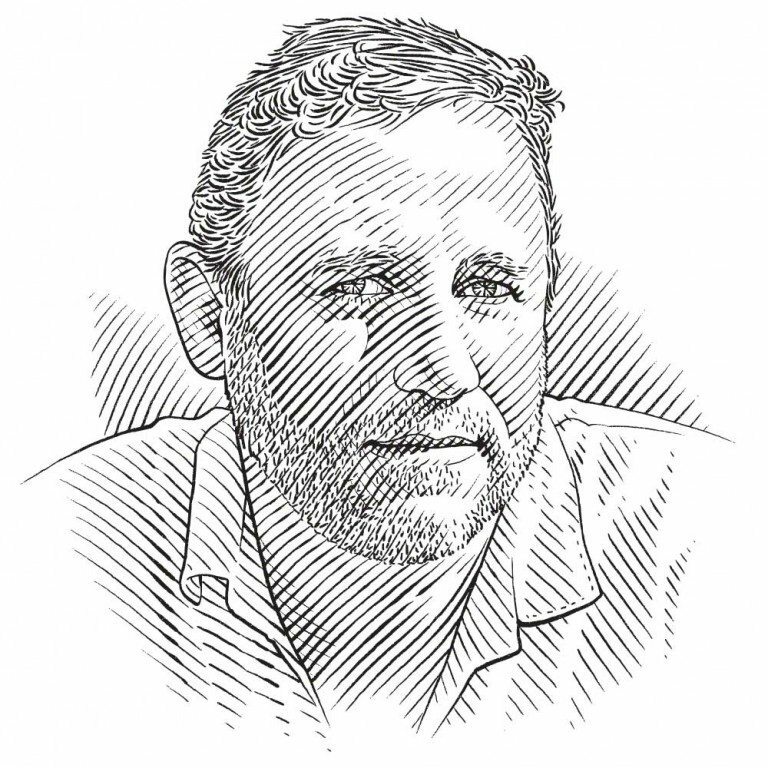 It’s been a long battle, but gradually Dr Nicolas Pilcher is persuading the shrimp fishers, and government, of Malaysia that a simple device can protect turtles without detriment to their catch. Sea turtles are iconic. They have the power to melt young hearts, to intrigue scientists and to mesmerise and impress the public. In Malaysia, where I am based and where I have devoted the past 20 years to finding solutions to sea turtle conservation challenges, the story is no different: sea turtles adorn tour buses, they are in just about every tourism brochure, they are on television adverts and in prime-time documentaries. They are featured in comic strips and on postage stamps. They are protected by more laws than in any other country in the world, as each state affords them protection over and above that provided by national legislation. But they can hardly be considered ‘safe’, as a suite of pressures, both foreign and domestic, threaten their very existence. The leatherback turtle, once abundant, is now functionally extinct. The olive ridley is down to just tens of nests per year. The hawksbill is hanging on precariously. Only green turtle numbers remain stable, with several hundred turtles nesting regularly at a few rookeries and an impressive 5,000 nests annually at South-East Asia’s largest nesting site off Sandakan, in Sabah (Borneo). Yet while Sabah’s turtles are currently abundant, they face some exceptional challenges. Turtle eggs are poached on all remote islands. Large adult turtles are caught by Chinese and Vietnamese fishing boats. Nesting sites are slowly being lost to coastal development. And by far the greatest threat to sea turtles in Malaysia is accidental capture in commercial and artisanal fisheries. Sea turtles have the unfortunate legacy of sharing habitats with some of our favourite foods, and of all the threats to their existence, the shrimp industry is perhaps the biggest. As shrimp trawl nets roll along the seabed they indiscriminately catch and drown numerous sea turtles – I estimate as many as 3,000 to 4,000 each year in Sabah alone. Putting an end to this unwanted by-catch has been my passion and inner driving force for the past decade. I started out as a research scientist studying the reproductive biology and early life-stage behaviour of sea turtles. Working with these fascinating creatures was almost addictive, with one exciting discovery leading to numerous new puzzles to be solved. But as the years went by I evolved – luckily faster than the turtles I studied – and devoted more and more time to finding ways to save my subjects from extinction. The situation for turtles slowly improved thanks to small management changes at national parks, but the threat posed by thousands of shrimp trawlers remained daunting. 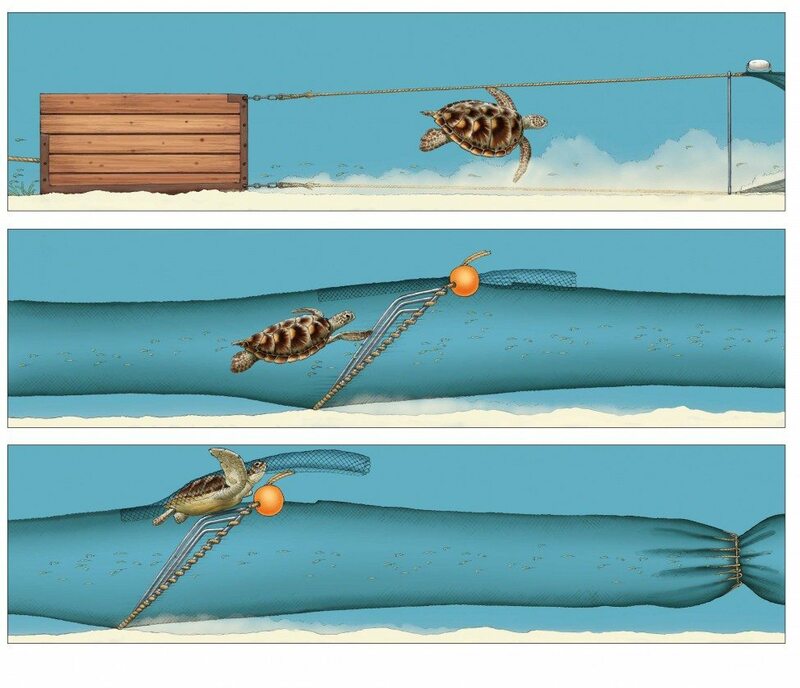 And yet a very practical and inexpensive solution existed in the form of Turtle Excluder Devices (or TEDs), which are fixed within a trawl net and allow a fisherman’s catch to be retained while turtles are excluded. 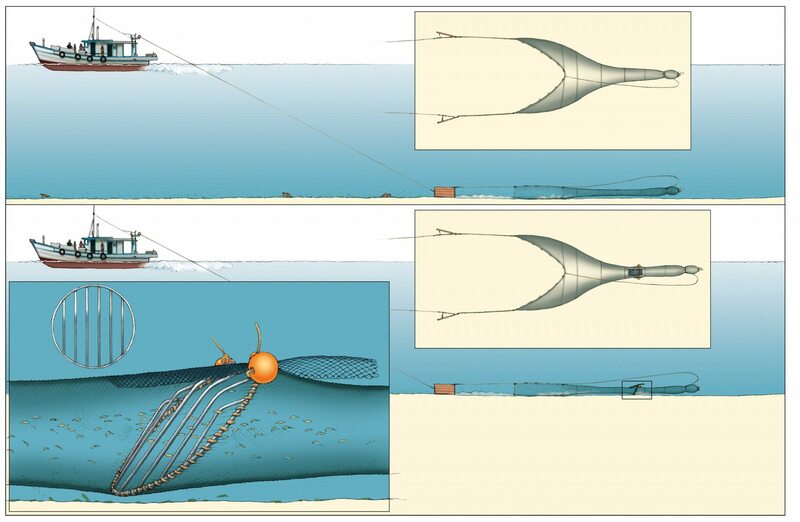 A TED is usually an oval frame with vertical bars set at precise spacing that allows shrimp and fish to pass through to the cod end, at the back of the net, while turtles and other large objects are forced out through an opening covered by a net flap. TEDs improve the quality of the catch, as large objects such as logs do not crush it, and the reduction of debris in the back of the net saves fuel, which is a benefit to fishers. Although TEDs have many advantages, fishers are often wary of using them because of the large exit ‘trapdoor’ in the net that allows turtles and debris to escape. They are concerned that their target catch will be lost through this opening, even though self-closing netting flaps cover it. In numerous trials across the world, however – and more recently through my work in Malaysia – we have found that the TEDs rarely cause a decline in catches. Even if they do, such a decline is normally offset by fuel savings and higher-quality product. For me the greatest problem was not that practical solutions did not exist, but rather that TEDs were ‘blacklisted’. In the late 1990s the United States adopted legislation requiring countries that exported shrimp to the US to use bycatch-reduction devices such as TEDs. Malaysia and several other countries took the case to the World Trade Organisation (WTO), arguing that this imposed the laws of one country upon another. The WTO agreed and the US had to re-open the trade. For several years this went back and forth, until the WTO finally recognised the US’s position and what it was trying to do – save turtles. The dispute left many leaders, attorney generals and ministers of trade and industry across South and South-East Asia feeling sour. Malaysia no longer had a trading partner in the US and was forced to sell at other markets at lower prices. So TEDs were not popular. Indeed, they weren’t welcome. Talk of TEDs was infrequent and then only in whispers. A Turtle Excluder Device (TED) is simply a metal grid with bars spaced about 10 centimetres apart. Set at an angle, it is typically installed in the neck of a shrimp trawling net. Shrimp and fish pass through the grid and are retained in the net, but the grid deflects large objects, such as turtles, upwards and out through a net flap. Against this backdrop and fearing that time was running out for Sabah’s turtles, in 2007 I sought permission from the director-general of fisheries to initiate a small pilot project using TEDs. Permission was granted, but I was asked to keep things small and quiet to start with. Undeterred and armed with funds from Malaysia’s Global Environment Facility Small Grants Programme (GEF/SGP), I set about contacting fishermen. In Sandakan, a coastal city that is near the Turtle Islands Park (where thousands of turtles nest each year) and hosts more than 1,500 trawlers, I tried selling the idea of trialling TEDs for a short period, ‘just to see how they would work on Malaysian boats’. At the outset I met Chua Yau Tsen, the owner of 13 trawlers and a shrimp processing plant who would soon become my ally and the greatest supporter of the TED programme. Chua let us install TEDs on his boats and chided other owners who remained on the sidelines. In those early days I used to spend more nights on the back of fishing boats than I did at home, much to the chagrin of my wife and three daughters. I learned how to sew fishing nets and fix problems with the TEDs, welding them myself when they broke or needed modifying. I had sewing needles, knives and twine in my car, on my boat, in my office and in my pockets. I had TEDs in my garage, in my office and in my car. Speaking the local language helped immensely and I became an adopted crew member on the boats, hauling nets and taking my turn at the helm. TEDs slowly gained acceptance among a small group of fishers; the programme was under way. When some of my guys complained they didn’t quite understand how TEDs worked, I raised funds from Conservation International (Philippines) to create a short documentary video using one of Chua’s boats and crew together with some turtles from another research project of mine. Another grant by Conservation International enabled me to take six fishermen on a study tour in the US, hosted by the National Marine Fisheries Service (NMFS). Although the team I took didn’t speak much English, they all spoke ‘fishing’ and were happiest when out on the boats. These guys came back as ambassadors to the programme. A year later, another round of GEF/SGP funding allowed me to expand the project to a second port in Sabah, where another project stalwart, Johnny Wong, came to my aid. During that phase I also put GoPro cameras on the nets to prove to fishermen that the flap was indeed closed and that turtles were being saved nearly every day. The camera footage was a real eye-opener and more fishing crews bought into the idea. I also convened a state-level workshop to spread the word far and wide, and both Chua and Johnny backed my claims. ‘TEDs work,’ they explained, ‘and not at any loss to the boats or our operations.’ Several grants from the Save Our Seas Foundation (SOSF) allowed me to continue to trial TEDs at an experimental level. Green turtles mate over a shallow reef flat. But the truth was that the voluntary adoption process was not working as well as I would have liked. It was time-consuming and I could reach only a handful of fishers willing to try TEDs, which they quickly removed when the trials were over. I needed the Malaysian government to come on board and drive the programme, because without legal backing TEDs were not going to make it to the big league. And a small NGO like mine was never going to implement a nationwide programme. And so another year later and with a grant from the US National Oceanic and Atmospheric Administration’s (NOAA) Pacific Islands Regional Office, I reprised my ‘TED Tour Guide’ role and took four government officials to visit the NMFS while TEDs were being tested with live turtles off the coast of Florida. The officials came back changed people. The experience had been a real eye-opener for them and probably the first time any of them had handled live turtles. A month after the trip I was summoned to the director-general’s office in Malaysia’s new administrative capital city, Putrajaya. I was somewhat anxious about what might ensue, given the history of TEDs at higher political levels, but I was greeted warmly and thanked for all I had done to date to get TEDs on Malaysia’s trawlers. The director-general even inquired whether he might be able to go on a similar site visit and see TEDs in operation for himself. The timing was just right: I had a grant application pending with the SOSF and asked whether I could include the overseas trip. It turned out to be the best thing I had done in years. The SOSF came through and six months later the director-general and I were on our way to Florida, accompanied by one of the government officers who had attended the previous year. 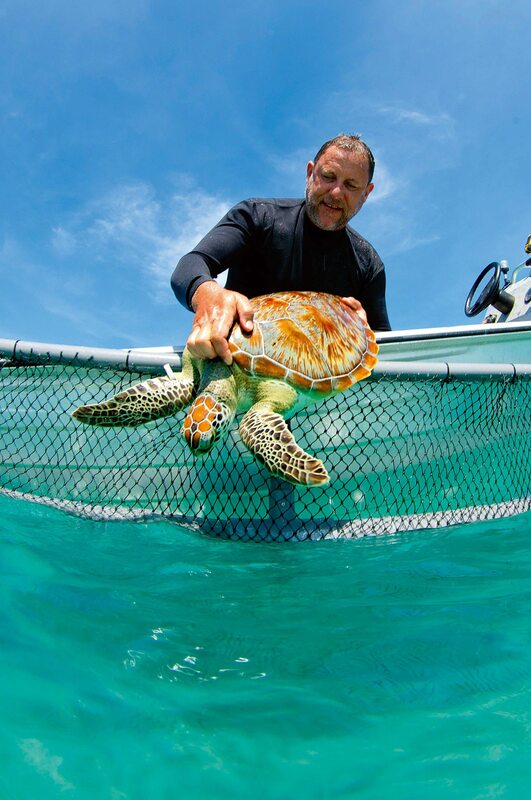 For the past two decades, Nick Pilcher has been working with turtles in Malaysia, encouraging fishers to equip their nets with Turtle Excluder Devices that will help them to avoid catching these gentle marine reptiles. In those intervening months the Department of Fisheries had started to push TEDs on its own at another port in Peninsular Malaysia, mirroring the work I was doing in Sabah. The fishers were extremely receptive and even came up with a modification that improved their catches and still kept turtles safe. They also used GoPro cameras and documented the safe exclusion of several turtles, which raised further interest back at headquarters. In Florida, the director-general and I submitted the Malaysia-designed TED to the NMFS for rigorous testing. It worked like magic: every turtle escaped in less than one minute. The NMFS certified the new TED for use in fishing fleets worldwide, while back home the director-general’s pride after witnessing the performance of the Malaysia TED drove the acceptance process further. He instructed his staff to establish a national steering committee and tasked it with developing a long-term implementation strategy. The committee has already met twice and a draft plan is on the drawing board. As the government embarks on the nationwide programme, I have been asked to be the technical advisor to the committee and the Department of Fisheries. This was a magical time for me, seeing the government take ownership of the TEDs programme and include TEDs in fisheries legislation. It really is momentous. Not all Malaysia’s fleets are equipped with TEDs yet, but this is just a matter of time. State by state and port by port, TEDs will be introduced one boat at a time – and as this happens, the future of Malaysia’s turtle populations will be secured. I’m just glad I got to play a role and help get the process under way.